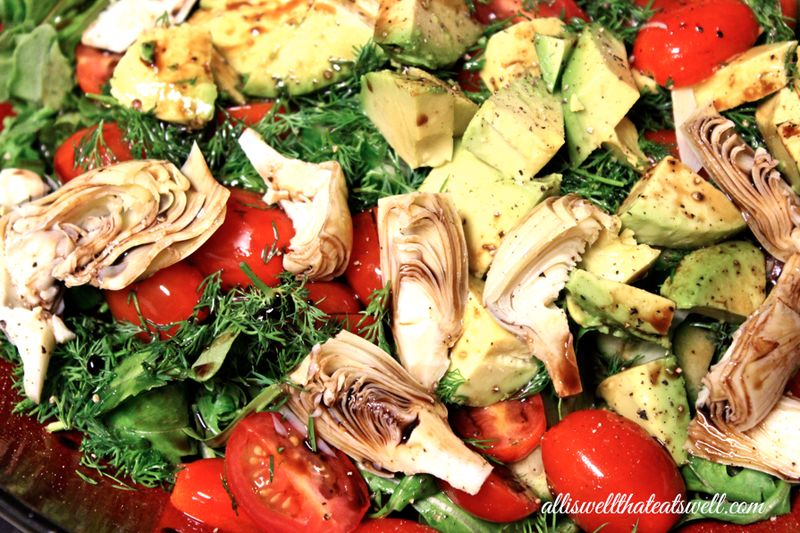 The combination of ingredients for this salad is so refreshing and perfect for the Spring season. The herbaceous quality of arugula with its peppery and mustard essences is complemented by the flavorful herbs, artichokes and cherry tomatoes in this mix. In addition the variety of textures from the creamy avocado to the crisp cucumbers makes each bite a real delight! Add tomatoes, artichokes, cucumbers, avocado and dill to arugula. Next, add olive oil, balsamic vinegar, salt and pepper to taste. So simple and tasty! Enjoy!